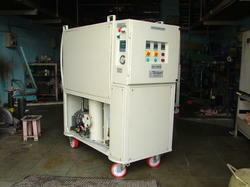 Providing you the best range of lvdh machine with effective & timely delivery. Keeping in mind the varied necessities of our customers, we are engaged in offering an extensive range of Low Vacuum Dehydration Machine. These are highly used in paper plants. The entire range of our products is made employing top-grade base material, obtained from the top and dependable dealers of the industry. Due to top performance and longer working life, these are highly used in the market. LVDH is ensuring that there is no Aeration, No Burning of oil, No oxidation. Thus restoring oil to its Original Properties.